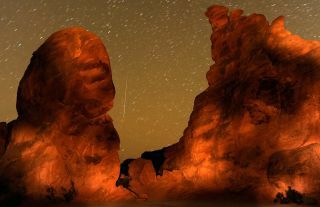 A Geminid meteor streaks between peaks of the Seven Sisters rock formation early December 14, 2010 in the Valley of Fire State Park in Nevada. The meteor display, known as the Geminid meteor shower because it appears to radiate from the constellation Gemini, is thought to be the result of debris cast off from an asteroid-like object called 3200 Phaethon. The shower is visible every December. This week is a real bummer if you are an enthusiastic watcher of "shooting stars." That's because the very best and the most reliable of the annual meteor displays — December's Geminids — will be reaching their peak exactly at the same time as the full moon. The moon turns full at 7:05 p.m. EST on Tuesday evening (Dec. 13) and will be situated not far from the star marking the lower horn tip of the constellation Taurus, the Bull. The moon (actually a so-called "supermoon" full moon) will be in the sky all through the overnight hours on past the first light of dawn on Wednesday morning and not very far from Gemini from where the meteors appear to radiate (hence their name, "Geminids"). Thus, it will not be possible to obtain any meaningful meteor counts, but since Gemini is passing directly overhead between 1 and 3 a.m. local time, the meteors themselves also occur in good numbers during the convenient evening hours. The International Meteor Organization (IMO) notes that: "The Geminids are the one major shower that provides good activity prior to midnight as the constellation of Gemini is well placed from 10 p.m. onward." Displays of the Geminid meteor shower are often described as "bright and intensely colored," and are noted as well their high count, which can reach 120 per hour for a single observer in the absence of moonlight, something that is all but out of reach this year. Still ... moving at 22 miles per second (35 km/s), or roughly half the speed of a Perseid or Leonid meteor, a single Geminid fireball can still be quite spectacular and bright enough to attract attention in the moonlight, as well as making an attempt just to see something … anything …worthwhile. We can offer a solution to the moon problem – call it "damage control" – for the 2016 Geminids. Still, that short window — from about 5 a.m. to 6 a.m. — of relatively dark skies on Monday, will offer you the best chance this year, of seeing more than a few Geminids fliting across the sky. At that hour. Gemini will be about halfway up in the western part of the sky. Although we'll still be about 36 hours from maximum meteor intensity, those who have access to a site with minimal light pollution and a clear, unobstructed view of much of the visible sky, might still come away seeing as many as 15 to 30 Geminids during that hour. As bad as the viewing circumstances are for this year's Geminids, next year will be quite a different story. In 2017, the peak of shower is expected to come at 2 a.m. EST (0700 GMT) on Dec. 14. That means that eastern North America will be in excellent position to view the Geminids at their prospective 120 per hour maximum with Gemini situated overhead. And since the peak will likely last for at least several hours (or more), means that the rest of North America, and quite possibly even Hawaii, will be able to watch next year's display unhindered by bright moonlight. If you're wondering about where the moon will be at the time, it will be just a narrow crescent, not rising until after 3:30 a.m. local time and not interfering in any way with the Geminids. In short … nearly perfect viewing conditions, but you have to wait until next year. As fans of the old Brooklyn Dodgers used to say (and it certainly applies to fans of the Geminid meteor shower), "Just wait until next year!" Editor's note: If you snap an amazing Geminid meteor shower photo you'd like to share with us and our news partners for a possible story or image gallery, send images and comments to us at: spacephotos@space.com.